Exploring the still-wild places of this planet is what we are all about. The form this takes, in this neck of the 'woods', is Canyoneering. We go down canyons. And find out what is there. And have fabulous adventures. We use ropes, often. Our hands and feet, quite a bit. Our shoulders, elbows, hips, thighs, calves, backsides - also quite a bit. Our cleverness, our wit, our fortitude, our sense of humor, our pluck, our desperation, our relationships with one-another, our spirit of adventure - all these at times, we use, on these adventures of the spirit. Sometimes it seems kinda silly, but it is fun. Deep, true fun. Gorgeous fun. Good-for-the-spirit fun. Imlay Canyon Gear makes canyoneering gear for exploring desert canyons, with a slant towards those of the Colorado Plateau. We make high-quality stuff. We strive for elegance. We preach low-impact canyoneering, and develop canyoning equipment that makes low-impact canyoneering possible / easier / safer / more elegant! We spend time out in the field testing our canyoing gear, honing technique, cross-training with other canyoneers, exploring new places, new possibilities, and new ideas. Canyoneering gear should work, and work well! Some parts of this website are not yet finished - don't be too surprised if you click on a link that does not work. Thanks - Tom (aka, the management). Gear We make tons of canyoneering gear: Packs, Rope Bags, Ropes, Canyon Kegs, Throw Bags, Harness Accessories and other stuff for going down canyons. 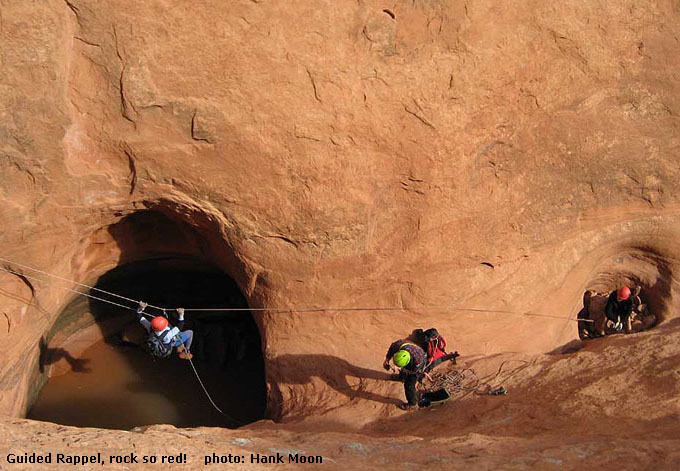 Find out about CANYONEERING GEAR. Where to Buy Whether you're look for "canyoneering gear" (U.S.) or "canyoning equipment" (everywhere else), we can hook you up. Find your local Imlay Canyon Gear Dealer or various online vendors here. Team The Imlay Test Team brutally and comically puts canyoning equipment to the test. And we have a lot of fun figuring out what works. Service Our Warranty. How to return faulty canyoneering gear. How to contact us. Service matters. Let's not forget what this whole thing is about - The Canyons. Some people hate calling this thing a "sport", or even (egads!) an "EXTREME SPORT"! Canyoneering is about the canyons, descending the canyons, and being a visitor to these extraordinarily beautiful places. The canyoneering gear? Sure, we make some cool gear, and it is fun to play with. But REALLY, this "activity" is about being a small person in an amazing place. Let the canyons seep into your soul. Allow the quiet, the mystery, the chaos to work its way deep into your being, making you calmer, gentler, sweeter. Do a good job of enjoying the canyons - leave 'em how you find 'em. Pack out your trash, including your own body wastes - use natural anchors - miminize your impacts. Please. These are playgrounds we all must share - share nice.